A GOLD Coast parish is rallying to support a mother who fears for her life if she is forced to return to Sri Lanka. Yvonne Evarts, 45, fled Sri Lanka in 2000 with her daughter, Caroline, now 20, and son, Keith, 13, when she was abused and persecuted by allegedly corrupt police, and now faces being deported in August. 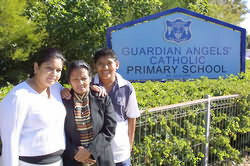 Guardian Angels’ Primary School at Ashmore in Southport parish, where Keith is a Year 7 student, has led a campaign to convince Federal Immigration Minister Amanda Vanstone to allow the Evarts to stay. Caroline Evarts, speaking on behalf of her mother, said the weight of that support – 1800 names on a petition and numerous letters – had persuaded Senator Vanstone to reconsider her original decision not to intervene in the family’s favour. Miss Evarts said they fled Sri Lanka because of the unjust treatment meted out to her mother by police authorities. Mrs Evarts and her children left behind her husband, Graydon, and older son, Geoffrey, when they came to Australia seeking protection. The Evarts applied for permanent residency but were rejected. Miss Evarts said the Refugee Review Tribunal then ruled the family had a genuine case for being allowed to stay and recommended that way to the minister. The Immigration Department subsequently informed the Evarts their case had been rejected and they must leave Australia by late August. They received a letter from Senator Vanstone’s office advising them nothing more could be done. Guardian Angels’ assistant principal for religious education, Bernadette Christensen, said that was when the school decided ‘it’s time to do something’. The school has rallied support through its own community, through the parish and through Brisbane archdiocesan agencies. A spokesman for Senator Vanstone said there was an application before her for a ministerial intervention on the Evarts’ case.